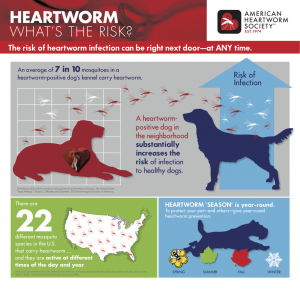 Here at the Animal Care Center of Shorewood, we are seeing an increased incidence of heartworm disease but are often asked “is heartworm prevention absolutely necessary and, if so, do we really need to give it year around?” The answer is YES because heartworm disease is a very serious and potentially fatal disease that has a means of prevention! Simply put, mosquitos pick up microfilaria or baby worms when they feed on an infected animal and pass them on to pets during their next blood meal. Once the worms gain access to their new host, they migrate to the heart during which time most animals are asymptomatic. However, as the worms grow over the next 6 months, they cause irreparable damage to the heart, lungs, and other organs which can manifest at coughing, lethargy, exercise intolerance, weight loss, and heart failure. In the most severe cases, the worms can block blood flow leading to a condition known as caval syndrome which causes labored breathing, pale gums, and dark coffee colored urine. Despite what can be found on the internet, there is no natural means of prevention. Instead labeled products are available as once-a-month chews, once-a-month topicals, or twice-a-year injections which work by killing the immature stages. Since they cannot do anything about the adults, these products should be started as early as possible and given in a timely manner. However, while very effective, nothing can be 100% guaranteed as doses can be missed or given late, chewables can be spit out or vomited up, and topicals can be washed or rubbed off. 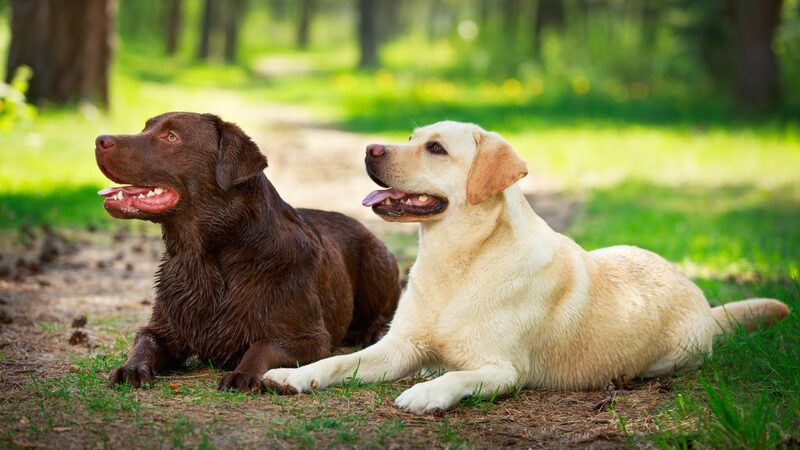 Thus, per the American Heartworm Society, “annual testing is necessary, even when dogs are on heartworm prevention year around, to ensure that the prevention program is working. If you don’t get your dog tested, you won’t know your dog needs treatment and the earlier the disease is detected the more successful and less risky treatment is”. 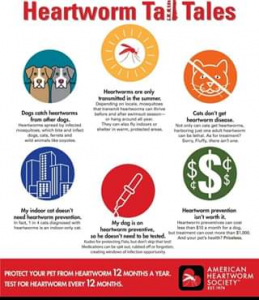 The American Heartworm Society also recommends year round prevention for all pets no matter how little time they spend outdoors because mosquitos are constantly adapting to colder climates to the point that some are able to survive over the winter indoors and there is no way to completely eliminate exposure to potentially infected mosquitoes. 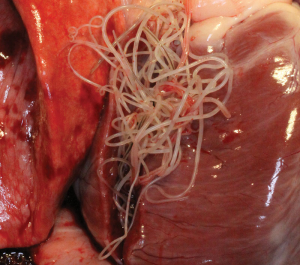 Since cats are not the main host for heartworms, the disease manifests quite differently. In fact very few worms fully mature to their adult stage but just a few immature ones have the potential to be deadly. While most infections clear on their own, they can damage the lungs in their wake or get lost and migrate to the brain, eyes, and spinal cord. Clinical signs to monitor for include coughing, lethargy, decreased appetite, weight loss, vomiting, collapse, and sudden death. The most important thing to note is that there is no treatment for cats so prevention is critical because once they are infected all we can do is close monitoring and supportive care or surgery. American Heartworm Society. (2018). Heartworm Basics. [online] Available at: https://www.heart wormsociety.org/pet-owner-resources/heartworm-basics [Accessed 1 Oct. 2018].